Even if you haven’t heard of burdock root, chances are you’ve seen it. While native to Europe and Northern Asia, in the US it grows as a weed, more commonly in the northern states. In an effort to beautify our yards, however, we may be missing out on a very valuable herbal remedy by treating it as a weed. It turns out that burdock root is probably the most famous detoxifying agent in the herbal arsenal. While most of us may not be using this herb to its full potential, burdock has been used for centuries to treat a host of ailments. One of its most notable health benefits is the effect it has on the liver. In studies, burdock root has been shown to help the liver heal from alcohol damage and protect it from further damage. The health benefits of burdock for the liver may be due to the powerful antioxidants found in the plant. Burdock contains phenolic acids, quercetin, and luteolin -- all powerful antioxidants that help protect your body from free radicals. 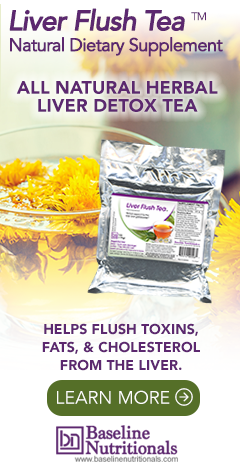 They work by helping push toxins out and by boosting the ability of the liver to remove toxins, which is why you’ll find this herb as an ingredient in Jon Barron’s Liver Flush Tea. Burdock has also traditionally been used as a "blood purifier" to clear the bloodstream of toxins. It can help cleanse the blood by increasing the effectiveness of all the body's elimination systems. Since it is also a diuretic (helping rid the body of excess water by increasing urine output), it helps the kidneys filter the blood. The bottom line is that by addressing toxins through a variety of pathways, burdock root acts as a blood purifier with minimal side effects and with minimal stress to the body, which is why it is an ingredient in Jon Barron’s Blood Support formula. Burdock also contains inulin, a natural dietary fiber and has been used traditionally to improve digestion. In fact, recent studies confirm that burdock has prebiotic properties that could improve health. In Traditional Chinese Medicine, burdock is often used with other herbs to treat sore throats and colds. Extracts of burdock root are found in a variety of herbal preparations, as well as homeopathic remedies. It has also been used as a topical remedy for skin problems such as eczema, acne, and psoriasis. The herb helps by increasing circulation to the skin and helps with epidermal tissue detoxification. It has also been reported to help in destroying bacteria. An oil infusion of burdock root may even help with scalp issues as well. It is said to boost hair growth as well as keeping your scalp healthy. The leaves have been used to help with burn patients, as the herb is said to help with pain management and reduce healing time. Considering all the health benefits already associated with this plant, you may be surprised to learn that it is still being tested and considered for new herbal treatments. For instance, studies show promising results in the use of burdock root for diabetes. Early studies have found that it may help lower blood sugar. It has also been recently used to treat other chronic diseases such as cancer and AIDS. Traditionally, burdock root is used in Japan and some parts of Europe as a vegetable, and people regularly add it to their diet due to its known health benefits. While it may be eaten as a cooked vegetable, you can also steep the root in boiling water and drink it as a tea. Alternatively, you can find it as a supplement in a variety of forms from capsules to tinctures. Learn more about burdock root and its use in blood cleansing. I would recommend trying a apple cidar vinegar wash. Works very well for conditions such as you stated. How often should I use burdock root steeped in water to cleanse my liver and blood. I rarely drink alcohol anymore but I did for many years.